Autism (AW-tiz-um) is a brain disorder that affects a child's ability to develop normal communication skills and social responsiveness to other people. An infant with autism may seem to behave unusually from birth or may develop normally for a short time and then show autistic traits. To diagnose autism, symptoms must have been present before the child was 3 years old. Autism is part of a larger category of disorders called pervasive developmental disorders, all of which affect the brain's development. People who are shy are not very talkative and often look down or away when someone else talks to them. They also seem to spend a lot of the time by themselves. Still, they do talk to people some of the time, especially to family members and friends with whom they learn to feel comfortable, and they like to be around people some of the time. Children with autism may appear to be shy, but shyness and autism are very different from each other. The symptoms of autism can range from mild to severe. Children with the most extreme forms of autism are almost totally isolated socially. Lacking the ability to relate normally to others, they seem always to prefer to be alone. Even within their own family, they seldom make eye contact or try to share their interests in toys or other objects. Many children with autism never learn to talk at all. If they do, they use language in unusual ways, such as by constantly repeating rhymes or jingles. They may refer to themselves by their own name, or as "you," instead of using "I" or "me." Sometimes they just repeat what someone has said to them, rather than replying in a meaningful way. Some children with autism may have above-average language skills, but often they do not use this ability to have conversations with others around them. What Are Some Other Signs of Autism? Children with autism often behave in unusual ways. Their activities are limited, and they may become very upset if there is some change in their environment or daily routine. For example, some may have temper tantrums if a piece of furniture in their room is moved or if they are put at a different place at the dinner table. * mental retardation is a condition in which people have be-low average intelligence that limits their ability to function normally. Characteristic behavior may include repetitive motor acts such as arm flapping, finger twisting, rocking, and walking on tiptoes. Some of these motions may be repeated for hours on end. Children with autism may also exhibit hyperactivity, fits of screaming, or self-injury, such as head banging. Often, children with autism fear harmless objects, such as a vacuum cleaner, but fail to perceive real dangers, such as crossing a busy highway. They may also be oversensitive to noises, lights, and odors, and they may dislike being touched. Many children with autism also have mental retardation * . About one in four people with autism may develop seizures * by the time they reach their teens. Autism occurs worldwide in all cultures. The prevalence is usually said to be 2 to 5 per 10,000 people. However, it may affect as many as 20 per 10,000 (or 1 in 500) if Asperger disorder * and other pervasive development disorders are included. Prevalence estimates have tended to increase along with increased public awareness of autism and Asperger disorder. Rates of autism are 3 to 4 times higher in boys than in girls. Autism is not transmitted from one person to another like a cold, so it is impossible to catch it from someone else. However, no one knows what causes autism. While we now know this is not true, until the 1970s, autism was thought to be the result of a poor mother-child relationship in infancy. Since then, researchers have come to believe that autism is caused by abnormal development of the brain before birth. However, scientists do not yet know the exact nature of the abnormality. Some studies have suggested that autism may result from defects in the action of brain neurotransmitters * . Other studies have indicated that brain cells and their connecting fibers may not grow properly in infants who develop autism. It is likely, however, that genes * have some role in causing autism. Parents who have one child with autism are more likely to have other children who develop the disorder (when compared to families who do not have children with autism). Identical twins (who share the same genes) have a high rate of concordance. In other words, if one twin has a condition, the other will likely have it too. If there is an autistic child in the family there is a higher rate of other developmental problems like language and learning disabilities in siblings. Also, autism is more common among people with the chromosomal disorder known as fragile X syndrome * . How Is Autism Diagnosed and Treated? There is no specific test for autism. Parents may first suspect that something is wrong if the child does not respond to them and dislikes cuddling or being held. Physicians need to rule out other disorders that have similar symptoms, such as deafness or mental retardation. To diagnose autism, doctors and psychologists * ask parents about the child's early development and observe how the child behaves, communicates, and relates to others. * Asperger disorder is a pervasive developmental disorder. Like autism, Asperger disorder is a developmental condition in which a child does not learn to communicate and interact socially with others in a typical way. Children with Asperger disorder have normal intelligence and generally good language development. * fragile X syndrome is a disorder associated with a faulty X chromosome (a chromosome is a structure inside the body's cells that contains DNA, which is the genetic material that helps determine characteristics such as hair and eye color; females have two X chromosomes whereas males have only one).Fragile X syndrome is associated with mental retardation, especially in males. * psychologists (sy-KOL-uh-jists) are mental health professionals who have specialized training in the diagnosis and treatment of emotional and behavioral conditions. Psychologists administer special tests to help them arrive at a diagnosis. Psychologists, like other mental health experts, also provide counseling services. 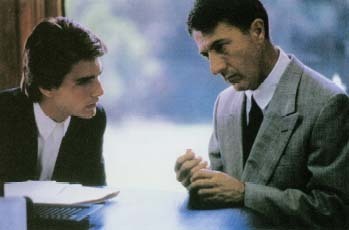 The Oscar-winning film Rain Man (1988) tells the story of the relationship between two brothers, one of whom is autistic. Charlie (Tom Cruise, left), a selfish car salesman, sets out to find who his father left his fortune to after his father dies. His search leads him to discover that he has a long-lost older brother, Raymond (Dustin Hoffman), who is autistic and has been living in a mental institution. rewards to establish new skills. Developing a communication system is key to treating autistic behavior. Special education programs tailored to the child's individual needs teach ways to better communicate and interact with others. For children with mild autism, educators reinforce existing skills and interests and build on them. Basic living skills, such as personal cleanliness and crossing the street, are also taught. Medications can decrease seizures, if present, and ease anxiety * and repetitive behaviors. Autism is not outgrown, and a child with the disorder usually will still be affected by it to some degree when he or she has grown up. With special education and communication training, many people with autism can learn to lead a more nearly normal life. Some with milder autism may even finish high school and go on to college. Many, however, will not be able to live and work independently and will always need special care. Janzen, Janice E. Autism: Facts and Strategies for Parents. San Diego: Academic Press, 2000. Grandin, Temple. Thinking in Pictures, and Other Reports from My Life with Autism. New York: Random House, 1996. Maurice, Catherine. Let Me Hear Your Voice: A Family's Triumph over Autism. New York: Random House, 1994. Seroussi, Karyn. Unraveling the Mystery of Autism and Pervasive Developmental Disorder: A Mother's Story of Research and Recovery. New York: Simon and Schuster, 2000. KidsHealth.org from the Nemours Foundation posts articles about autism at its website.